The zero conditional is present tense and expresses a fact. It tells about something that always happens under certain conditions. If people get hot, they usually sweat, but if dogs get hot, they pant. When babies are hungry, they cry. The 2nd conditional imagines what would happen if something were true-- but it’s not. This is often called the “present unreal conditional.” The verb after the ‘if’ is in simple past form, even though it’s talking about the present. This tells listeners that the suggestion is imaginary, not true. The 3rd conditional talks about how the past might have been different if different steps had been taken. The verb after the ‘if’ is again farther into the past-- in this case, a past perfect, compared to a conditional perfect using would or another modal in the independent clause. For a little more about how to use 'will,' would,' 'might,' 'could,' and other modal verbs that can help form conditional tenses, see Modal Verbs. 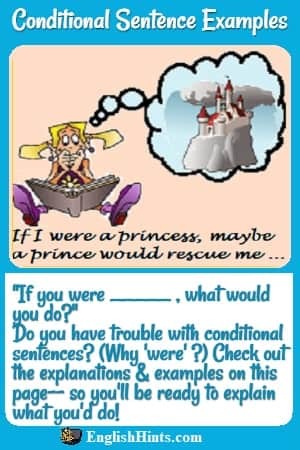 Home> English Verb Tenses> Conditional Sentences.